Hamas reportedly commits to ending terror attacks in Judea and Samaria as part of reconciliation agreement with Fatah. The Arabic newspaper Asharq Al-Awsat reported this morning, Sunday, that the Hamas terror group has committed not to conduct terror activity in Judea and Samaria, within the context of a reconciliation deal with Fatah, according to NRG. The deal, signed by the two factions in Egypt on Thursday stipulates that Hamas is to end its terror activity against Jews in Judea and Samaria. 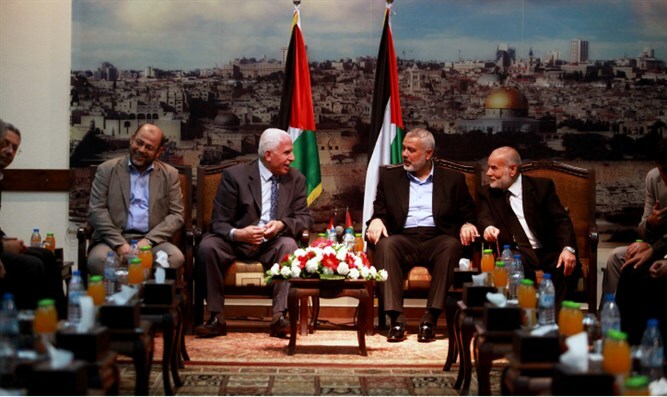 In exchange, Fatah and Hamas will coordinate future peace agreements with, and war efforts against, Israel. “We want to allow an opportunity for an agreement, and we will maintain Hamas’ commitment to true partnership, whether or not the harassment and arrests [by the PA] stop and prisoners are freed,” the official told the paper.